Fresh from signing a massive new deal with Genting Poker, Bluff meets the Hendon Mob, the poker-boomers who never went bust. We’re sitting by the Regent’s Canal outside a photo studio in East London discussing the respective personalities that make up The Hendon Mob, particularly the fearless gamble of “Crazy Horse,” versus the methodical diligence of “The Elegance”; two best friends who have enjoyed huge success as players, but are apparent polar opposites. “How would you sum up each other’s personalities in a few words?” I ask. “And I’m the piss-taker,” Ross adds, somewhat superfluously. Ram spies an opportunity to grab a Marlborough Light and slink off. He hates interviews. He’ll be the quiet one, then. George Harrison. In the meantime, Barny and Joe take over the PR responsibilities. They’re the organised, business-like members of the team. They make sure the other two turn up to photo shoots on time. They’re dab hands at interviews, too: Joe is talkative, meticulous; Barny charming and gregarious. Natural salesmen. After all, they’ve been at it for years. They were the first poker players to see themselves as “marketable”; they foresaw the poker boom and seized the day. As the first players to get signed up, they invented poker sponsorship. And now, as world-class players across the globe struggle to get deals in this uncertain climate, the Hendon Mob are here to announce their new, trend-bucking deal with casino giants Genting, for an officially undisclosed, but off-the-record, extremely hefty figure. People scoffed at their dreams in the early days, when the lads, convinced that poker was going to take off in a big way, began knocking on doors looking for sponsorship. Poker players can be notoriously cynical, and the sight of four of their own, intent on becoming salaried “celebrities” must have seemed fairly ridiculous at the turn of the century. It all began with two home games, back in the nineties; one in Hendon, and another in Archway. The Hendon game was held in Joe’s flat every Monday night, and Ram was a regular. Both had gambling in their blood and became firm friends. The Mob were also quick to embrace TV and internet poker, appearing on the first ever Late Night Poker in 1999. It was the first time hole card cams had ever been used, and so mistrustful were the seasoned pros of this new concept that creator Nic Szeremeta was struggling to fill the seats. “People were saying, ‘I don’t want people to see how I play, I’ll never be able to win playing poker again,’ ” remembers Joe. In September 2000, an article appeared in the London Evening Standard, written by Victoria Coren about her friends the Mob. There was a colour photoshoot of the lads on Archway Bridge, dressed in dark suits, and on that day, according to Joe, the Hendon Mob brand was born. “It was kind of our kind of birth certificate,” he says. Around the same time the Hendon Mob website was launched. It was first conceived of as a place where people would go if they were interested in sponsorship; more of a contact point for potential investors than the gargantuan information database it’s become. To begin with, it was just one page. A friend would update it once a month in return for a crate of Guinness (“He was overpaid,” jokes Barny) and Barny would do a write up of Mob activities for the month. Today, this would be called a “blog”, but back then it was a journey into the unknown. Now it’s the number one UK poker website with the world’s biggest poker database. When the database was launched, it had 20,000 players, and now they’re approaching 200,000, with hundreds of thousands of unique users every month. But that’s not all. Genting has 44 casinos throughout the UK, of which about 25 have poker rooms and they are talking about creating a national tour, probably something to rival the GUKPT and UKIPT. “More details will come out they become available,” says Barny “but we’re going to be travelling around the UK and we’re really looking forward to it. Instead of playing these massive events around Europe, we’re going to be playing the more affordable events in the UK. While the Mob were eager to embrace the poker explosion, I also get the sense that they miss the days when being a poker player was like being part of a secret club: “Poker was our world, and now we’re just in the poker world,” they say. But I’m also interested to know what they think about the current situation, and as pre-poker boomers and post-poker boomers, they’re in a better position than most to comment. The situation with their former sponsors certainly must rankle, particularly when you consider the lengths they’ve gone to to popularise the game and portray it in a positive light. They’re excited, too, that after riding the shirt tails of the poker boom for so long, the deal with Genting will allow them to go back to their roots. Barny pauses for thought. “It feels like we’re coming home,” he says. 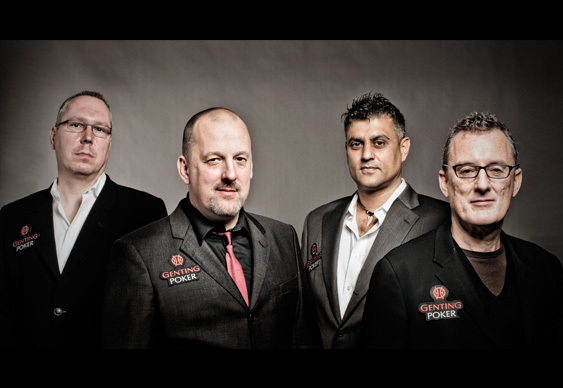 The Hendon Mob are sponsored by Genting Poker. Visit thehendonmob.com and gentingpoker.com.